Soak up the Splendors of the Big Island from your own Oceanfront Vacation Condo Rental at the beautiful Low-Rise Bali Kai . . . Fronting Secluded Banyons Beach and framed by the towering 8,200 Ft. Mt. Hualalai. Ideally located in the World-Class Vacation Destination of Kona — You’ll Marvel at the breathtaking views of the Pacific right outside your Door . . . 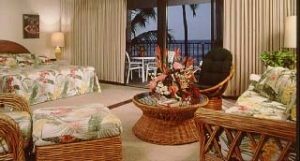 While the Sound of the Surf Beckons your Call from your Own Private Lanai. 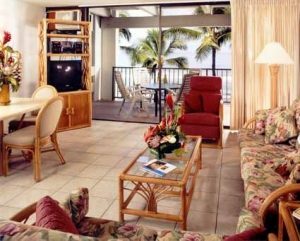 Your Big Island Vacation Condo features Fully-equipped Kitchens, In-Suite Washer/Dryers, Cable TV/VCR’s. For your Added Vacation Pleasure, Stroll our Tropical Grounds with Swaying Coco Palms enjoy a Refreshing Dip in the Pool, Relax in the Jet Spa . . . Then sip a cool Mai-Tai While You Toast another- Spectacular Sunset from our Private Beach. Activities complimenting your Big Island Tropical Paradise Getaway showcase adjacent World-Class Golf, Deep Sea fishing, beautiful white & black-sand Beaches and more . . . with Relaxed Water-side Shopping & Dining just Moments Away. Paradise Calls at the Ideal Big Island Tropical Getaway Locale on the Spectacular Kona Coast . . . at the Oceanfront Bali Kai. 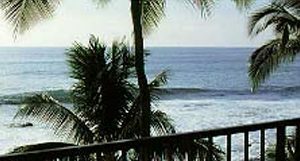 Your Big Island Vacation Resort Getaway features your Choice of Studio Suites ideal for 2; Spacious 1-Bedroom Oceanfront Vacation Condo Rentals that Accommodate 4 Guests; Expansive 2-Bedroom/2-Bath Hawaii Condos – Featuring Oceanfront Master Bedrooms – that sleep up to 6 people or Deluxe 3-Bedroom Big Island Condos that accommodate 8. All Linens & Towels Provided.